At least 77 people were killed by heavy rain in Beijing at the weekend, more than double the number previously said to have died, Xinhua news agency says. Authorities in the Chinese capital said 66 of the 77 bodies found so far had been identified. Most had drowned. The official death toll had stood at 37 since Sunday but many angry Beijing residents said it was underestimated. 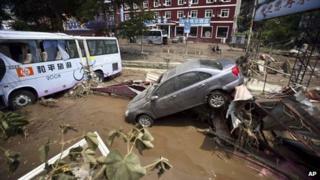 The rainfall was the heaviest in Beijing in 60 years, bringing chaos to transport systems and power supplies. Major roads were flooded and more than 500 flights cancelled, with thousands of people stranded at the city's main airport. More than 65,000 people had to be evacuated. The authorities have been criticised for being slow to acknowledge the human cost of the floods. On Wednesday the mayor of Beijing resigned. Officials said the move was not related to the flooding, and that he was taking up a more senior role.